You probably know by now about the $8,000 first-time home buyer tax credit. You may also know that it expires soon. Some form of the credit has been available for over a year now, but it is going away soon. To qualify, buyers must close on a home by November 30, 2009. While that date may seem far off, it is actually right upon us when you consider the timeline involved in buying a home. The typical buyer spends six weeks searching for a home. That buyer then spends a few days negotiating and reaching an agreement with the seller. From that point to closing usually runs another 4 to 6 weeks. All together, the process takes about three months. The tax credit is only available for the next four months. So now may be the time to start shopping for a home if you or someone you know is a first-time home buyer (and remember that a first-time buyer includes someone who has not owned for the past three years). We are seeing a great many people take advantage of the credit. The tax credit, todays reductions in home prices and great mortgage rates have all combined to create levels of affordability not seen since 2003. For more information on the tax credit see our February 18, 2009 and June 3, 2009 blog posts. In the following story, published today by REAL Trends, we see confirmed what we experience every day in our local housing market buyers are responded to the tremendous affordability that many of todays homes offer. For related stories on our local market see our postings on May 11, 2009 and June 26, 2009. Price declines and low interest rates are motivating millions of home buyers to shop for bargains in the most affordable housing market in 28 years, yet at the same time only one-in-ten of today's home owners say they have delayed selling their home due to those same market conditions, according to the new national Realtor.com® Homeownership Survey. Based on the Realtor.com survey, affordability is clearly driving more than two-thirds (65.2%) of potential buyers back into today's housing market. Nearly one of five prospective buyers (19.6%) say foreclosure bargains in their communities would motivate them to purchase a home, the most important reason they're interested in buying in the near future. An additional 15.5 percent said they're motivated to buy soon because they think prices are as low as they will go, and another 15.5 percent said they're motivated to buy before interest rates rise. For 14.6 percent of first time homebuyers, the Federal $8,000 tax credit is the impetus to purchase a new home in the future. Distressed sales of foreclosures and short sales, which constitute nearly half of all existing home sales today, are not universally popular with buyers. Two-thirds of those surveyed (66.3%) said they are not likely to consider buying a foreclosure in the future. However, if sellers were willing to pay closing costs, 23.9 percent would be motivated to purchase foreclosures, and 19.5 percent said they would buy a foreclosure if there was a higher level of certainty related to home repairs required to make the home "move-in" ready. Current fear of foreclosure has lessened since the last Realtor.com Homeownership Survey in March 2009, when 52.5 percent of respondents expressed concern that they or someone they know may face foreclosure in the next 6-12 months. In this latest survey, the number of home owners concerned about foreclosure dropped 8.7 percent compared to March 2009, and the number of owners feeling "not very concerned" or "not concerned at all" increased by 8.4 percent combined in the past three months. Since last fall, Coldwell Banker has led the real estate industry in the movement to place content in consumer-friendly fashion on mobile devices, such as the iPhone, Blackberry, and other smart phones. For those consumers that like to use this technology, they will find the best optimized real estate website for those devices. The site is specifically designed to fit smaller screens to make searching on the go much easier. 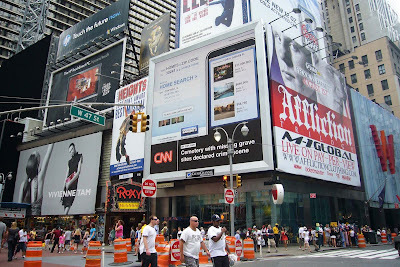 To help promote Coldwell Bankers mobile website technology, the company is running an interactive billboard in New Yorks Times Square. 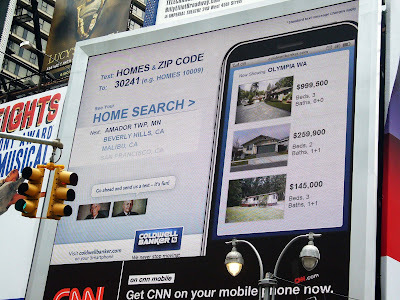 The billboard allows viewers to pull property listings from a particular area by texting the zip code and the word homes to 30241. The photos below show some of our local listings that have been featured on the billboard. A great many clients are now using smart phone technology in their daily lives. Coldwell Bankers advancements in this area is just another example of the companys commitment to deliver the tools consumers want along with the experienced real estate professionals they need. Click on this link to YouTube to view more about this story. With a great many homeowners around the country facing the prospect of foreclosure, the stage is set for scam artists to prey on these distressed people. In response to loan scams flaring up around the country, a national bankers association is offering tips to consumers to help avoid foreclosure relief scams. We have not heard of too many of these scams being run in the Thurston County area, but consumers should nevertheless be on guard against illegitimate offers for relief against foreclosure. Thurston County has not experienced nearly the volume of foreclosures seen in the hardest hit regions of the country, primarily in 5 states, California, Arizona, Nevada, Florida and Michigan. Since the beginning of April, the county has averaged 36 foreclosure filings per week. Washington, D.C. (July 7, 2009) The Independent Community Bankers of America (ICBA) and the nations nearly 8,000 community banks are arming consumers with information to help protect themselves against loan scams. Many Americans are being targeted by scams that promise to help them avoid foreclosure or refinance their existing mortgage to a lower rate, said R. Michael Menzies, ICBA chairman and president and CEO of Easton Bank and Trust Co., Easton, Md. Its essential that homeowners be vigilant and protect themselves against these scams so that they dont wind up in an even worse financial situation. Guarantees to stop the foreclosure processno matter what your circumstances. Instructs you to not contact your lender, lawyer or credit or housing counselor. Collects a fee before providing you with any services. Accepts payment only by cashiers check or wire transfer. Pressures you to sign paperwork you havent had a chance to read thoroughly or that you dont understand. Any community bank customer who is having problems with a mortgage should visit a local community bank for more information about legitimate programs and loan options available to them, said Menzies. The housing numbers for June shows significant improvement in the local market. Over the past several months weve witnessed improvements in a couple of key categories. Inventory levels have been down and pending sales have been on the rise. 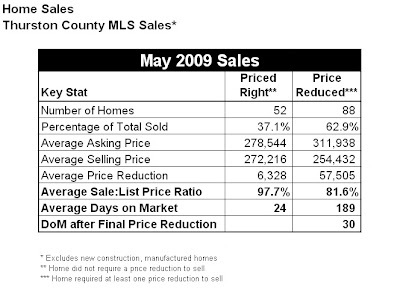 Until now, however, closed sales lagged 2008 figures by a significant margin. Through May of 2009 homes sales were off 24% from the same period a year ago. In June, however, closed sales are up from a year ago. While the increase is not huge, 303 sales this year vs. 299 last year, it is just the third time in the last 29 months that a current month has bested the prior years figure. The others were January 2009 and February 2007. The biggest reason for the uptick is price. Buyers are seeing the values and they are acting on it. The countys average sales price year to date is now $262,460, down 9% from the year ago when prices averaged $288,854. Perceptions are a very powerful thing. In good times, perceptions run to the extreme on the high side, and in more challenging times they run to the low side. Among the current perceptions about the housing market is the idea that everything is selling slowly and well below asking price. A few years back, we had an equally strong perception that everything was selling lightning fast, and well above asking price. As in all things, the reality is different than the perception. Three important measurements of market success expose the misperceptions that have abounded. The average days on market, the number of homes sold, and the sale to list price ratio, all reveal the truth in the marketplace. In sum, the truth is that houses must be well-priced to sell in any market and there are buyers in any market as long as price matches the existing supply and demand picture. 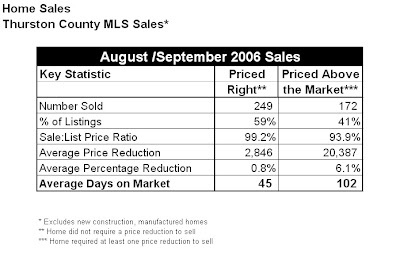 A great example is found at the peak of our unprecedented sellers market, in late summer of 2006. We commonly hear that everything sold in just a couple of days and for well above asking price. The reality is not so. In August/September of 2006, well-priced homes were in fact selling quickly, averaging just 45 days on market. That is fast compared to 90 day averages seen in a balanced market, but still far longer than just a few days on market. Also, not all homes were well-priced. We define well-priced as those homes that did not require a price reduction before selling. Only 59% of homes at the time were well priced. The other 41% that required price reductions sold at just 93.9% of asking price and sat on the market an average of 102 days. So even in the midst of a market that was hyperactively escalating, it was still possible to over-price a home. Buyers ignored 4 out of 10 homes until those sellers brought prices down. Equally telling is the fact that well-priced homes still averaged just 99.2% of asking price. That is close to full price, but it certainly does not support the idea that every home was bid-up. To be sure, many homes were, but most were limited to homes that were listed just below market value. Buyers themselves then exposed the true value by bidding the home price up. In todays market, perceptions are equally misaligned with the markets actual performance. The most common perception is that homes are taking a very long time to sell. In fact, well-priced homes today (based on May 2009 sales) are selling in an average of just 24 days three weeks faster than the peak of our hot sellers market. On the opposite end of the spectrum, homes that required at least one price reduction before selling sat on the market for an average of 189 days, and required an average price reduction of 18.4% before selling. The biggest reason that our market is moving faster for well-priced homes has to do with a couple of general market conditions. The first is that interest rates are very low and buyers want to act while they are down. Secondly, the $8,000 first-time homebuyer tax credit, which expires later this year, is propelling those buyers more than ever. Buyers know these are fleeting conditions, so they are acting now. However, the growing disparity in days on market between well-priced homes and those that require at least one price reduction tells us that buyers are being ever more critical about the market. They are ignoring those homes that do not present value, but they are jumping quickly on those that do. And as we saw during the peak, these well-priced homes are selling at close to full asking price - 97.7%. Last nights decision by the Port of Olympia sets in motion one of the most important opportunities our community has for realizing the goal of more market rate housing in downtown Olympia. 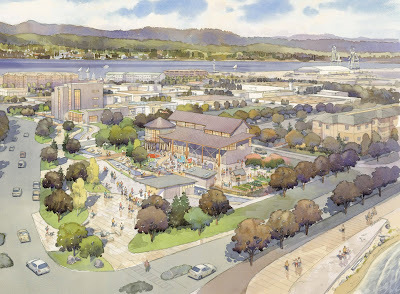 The Port selected Tarragon as the developer for the land surrounding the new Hands On Childrens Museum on East Bay. The vision is to create an area of mixed uses, including office, retail, a hotel and conference center, and residential space. The residential component will help start the city on a path toward meeting its goal of 2,500 units of market rate housing in downtown. Establishing a greater diversity of housing in downtown will help our community in so many ways. Concentrating more of our growth in downtown will reduce sprawl that occurs even with the Growth Management Act restrictions that exist. Over the next 20 years our population is expected to grow by 128,000 residents. We must get serious about creating greater densities in the urban core if we are to find places for people to live and maintain some of our rural communities. Another benefit is job retention and creation. A healthy downtown will support existing business, and attract new businesses and tourism, which has the effect of importing dollars to support jobs. Most downtown business owners know that increasing housing and adding a conference center are both vital components to creating a financially sustainable downtown core. Finally, creating greater densities adds to the diversity of our core, which in turn enriches our community. An excerpt from the book Rebuilt Green the story of the Ecotrusts efforts in building its headquarters in the Pearl District in Portland, Oregon, captures this sentiment perfectly. In the preface to the book, the head of Ecotrust, Spencer Beebe, recounts words from one of his board members, Jane Jacobs. She states that Good things come from evolution, not revolution; from building up new things, not tearing old things down. Spencer continues that Jane reminded him that civilizations need farms, forests, and rivers to support dense populations in the cities, and that cities repay the favor by getting lots of heads together to innovate and invent. Whether ones concern is natural ecosystems or economic systems, density propels evolution. With great leadership, our community is on the verge of propelling itself to new heights. Every urban renewal project that occurs around the world starts with a catalyst. Several current projects, LOTT Administration, a public plaza, and the Hands On Childrens Museum, underway at East Bay are the best catalyst for city wide renewal that this community has ever seen. We must make the absolute best of this opportunity. LOTT is already underway with its new administrative and educational center downtown. Construction will be complete next year on this new world-class interpretive center that will showcase reclaimed water. This new facility also will house a state of the art cogeneration plant, turning methane gas into power. When complete the new LOTT facility will be a beacon of environmental stewardship and a draw for business and tourism. LOTTs neighbor to the east will be the new Hands On Childrens Museum, which does so much to help children and families in our community. Other cities that have achieved successful urban renewal projects did so by locating childrens museums in their downtowns. The new 25,000 square foot facility is the anchor of the East Bay renewal. It will be a draw from more than a quarter of a million visitors to downtown each year. Along with these two great projects, an outdoor one-acre public plaza will be constructed. This space will give the community another great gathering space on a beautiful peace of property. Under Scott's leadership, <?xml:namespace prefix = st1 ns = "urn:schemas-microsoft-com:office:smarttags" />Providence has continued to grow in service to our community. St. Peter Hospital has received numerous awards and recognition for its outstanding work. The hospital ranks in the top four in the state in charity care, and has a collection of some of the best medical doctors, nurses, and staff in the nation. A community our size is fortunate to have a care facility that offers so much. As real estate professionals, we know that quality of life is one of the biggest drivers of the value of real estate in any area. The presence of Providence in our community adds tremendously to not just the health of our community but to the vitality of the entire region. So we take a moment to acknowledge Scott and thank him for his service. The current rates are much lower than at this point last year when they reached 6.32%. And while the rates are higher than the low point seen in April, housing sales continue to climb. The return of home prices to sustainable levels has defused the up-tick in interest rates. Perhaps the best example of the interplay between home prices and mortgage rates is the failure rate of mortgage loan modifications. Over the past 18 months, many loan providers have reworked borrowers adjustable rate mortgages to bring interest rates down to better levels. Despite the significant decreases in interest rates through the modification process, a huge percentage of these borrowers still end up in default. See our blog posting on 12/23/2008. The reason is that the mortgage is still tied to a home price that was simply too high to sustain. This means that price becomes the most important factor to buyers. Interest rates will rise and fall. Rates are not in the control of the buyer or seller. Setting price to match the market forces, however, is. Many factors influence a homes market value, including location, condition, economic landscape, supply of homes, and mortgage rates. As interest rates rise, fewer buyers will qualify for mortgages, which means that sellers will adjust price to match that lower level of demand. In the end, if mortgages are based on a sustainable purchase prices buyers will be able to afford the home purchase regardless of the mortgage rates prevailing at the time. In our local market, the prices on many homes continue to provide that opportunity to home buyers and sellers. Olympia Ranks as in Top 10 places to live in the U.S. In its annual ranking of the nation's Best Cities, published in the July 2009 issue of the magazine, <?xml:namespace prefix = st1 ns = "urn:schemas-microsoft-com:office:smarttags" />Olympia came in as the 6th best place to live, work and play. The report, which labels Olympia as the "Northwest Jewel", highlights the city's cultural attractions, work force and jobs, and educational opportunities. Come join the celebration of this recognition at 11:00 a.m. on Friday June 12th at Olympia's Farmers Market.